Pat and I decided on a last minute overnight road trip. Not being able to decide where to go, I fired up Google maps on the iPhone and sized the map to fit an area within 5 or so hours’ drive. We then closed our eyes, turned the phone and pressed down an area along the map’s edge. That would be where we’d go. No offense to Pickneyville, Illinois, but we weren’t thinking that would be our prime destination. Plus, it was still too close. So we scrapped this plan and simply opted to head north into Michigan. We thought it would be nice to stay as close to the coast of Lake Michigan as we could. We did a Lake Michigan loop back in September 2005, going north along the coast in Illinois and Wisconsin, then east through the UP and across the Straits of Mackinac and down into the Lower Peninsula. This time we headed northwest out of Indianapolis on US 421 (the Michigan Road). 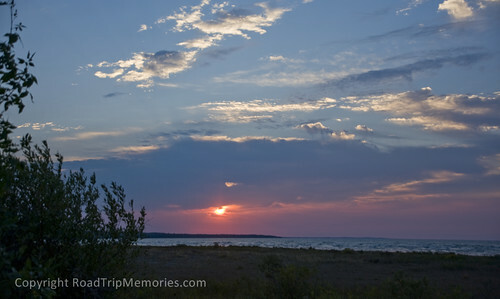 In Michigan City, we headed into Michigan on US 12 until it branched off and headed east. At that point, we continued north as closely along the coast as we could, following the Red Arrow Highway or Lakeshore Drive as applicable. 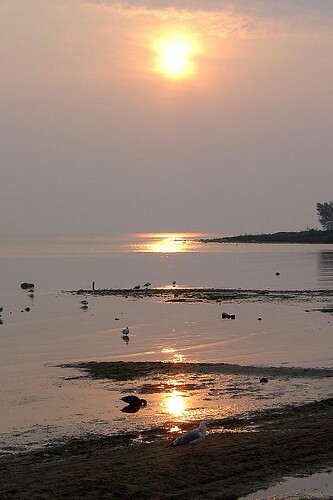 We decided to call it a night in Benton Harbor. After a few failed Priceline bid attempts, we just booked a specific hotel HOJO) and price through them. We were in the HOJO parking eivrflot at this point so we just walked in. It took a while for the reservation to get sent by Priceline to the hotel. In the meantime we occupied ourselves with meaningless small talk and listening to the lone desk clerk handle several complaint calls one after the next. “hello, front desk! I’ll be up shortly and will spray with air freshener. Yes, that’s all I can do, sorry!” Sure enough a few minutes later, but felt like an eternity, they received it and we were on our way upstairs. Our room was standard; not great not bad. A bit worn but not dirty. Certainly ok for a night’s stay. The next day (Labor Day), we headed over to Grand Rapids to visit The Ford Museum – Gerald R. Ford Presidential Library and Museum. Lastly, to satisfy our hunger, we decided to pay a visit to the iconic Rosie’s Diner in Rockford. It’s most recent TV fame was likely as a result of being featured on the Food Network’s Diners, Drive-ins and Dives, but many will remember it from the 70’s Bounty paper towels commercials featuring actress Nancy Walker as waitress/owner Rosie. Then, time to get home to Indiana…till next time! We started out of Indy Saturday morning, following the old alignment of US 52 (Lafayette Road) out of town, hooking up with current 52 north of Lebanon, then merging onto US 41 west of Fowler, IN. We took 41 through NW IN, and then followed it along Lakeshore Drive through Chicago. We found our way onto Sheridan Road which stretches from Chicago well into Wisconsin. Through Kenosha, we found the list of motels (most of them) in question. Some were nice…others were…well, you know. After going through Milwaukee, we jumped on the Evil I for a while. We roamed around Port Washington for a while, then stopped at a Piggly Wiggly in Sheboygan for some Kringles. 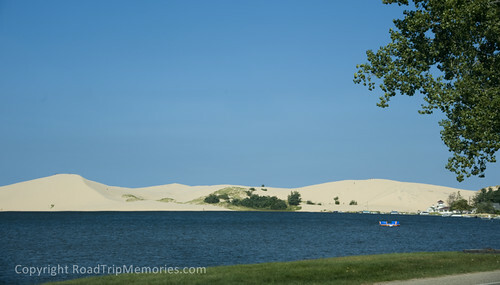 We planned on staying in Green Bay our first night, but upon talking about a trip my parents & I took in 1985 in the same direction, we decided to retrace part of that trip to see if I could find some spots we ate and slept. Alas, the Holiday Inn in Green Bay at the Marina was still there! In ’85, the folks & I were in its parking lot at midnight trying to find a room. We were outta luck that weekend because the big airshow in Oshkosh was that same weekend and there was nary a room to be had for a couple hundred miles in either direction of Oshkosh. I vividly remember sitting in the back seat of my dad’s ’77 Impala, 17 years old and listening to he & my mom have a “disagreement” on the future of our trip to the UP of Michigan, Wisconsin, and Minnesota. It was midnight and we had nowhere to stay. Mom wanted to turn around and go home (some 400 miles away, mind you) and dad (aka, the driver) would have no part of it. Sooo, in an effort to make lemonade out of our lemon, we decided to keep driving north. I remember pulling into a neon lit cafe somewhere on US 141 north of Green Bay and having a 1am “dinner”. 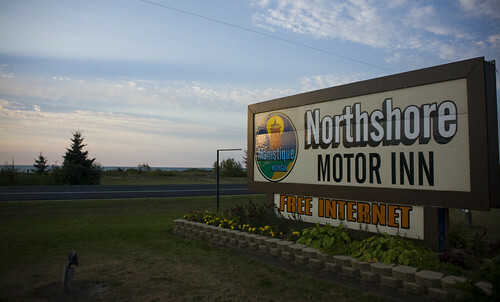 We finally found a place to stay at 2am at the Holiday Motel in Iron Mountain, MI, just across the WI/MI border. So this trip last week, I didn’t quite find the cafe, but since it was dark (not 1am dark this time!) there were a few possibilities (one of which we ate at), but I’ll have to make another trip to confirm the locale of the cafe, if it’s even there. So forging ahead, we made it to Iron Mountain. I knew there was no longer a listing for a Holiday Motel there, but I was hoping they had just changed hands, and they did. It was now an “America’s Best Inn” or something along those lines, located on US 2. I had a picture from ’85 of the exterior of the room we stayed in, so I knew where it was, but I was too tired to think of asking for that particular room upon checking in. So for memory’s sake, I took the same picture, some 20 years later. That’s where Jennifer & I ended the retracing of that ’85 trip. We were heading back east on US 2…in ’85, we continued north on 141. That was fun to relive that little memory for me. That was the last trip I took with my mom, as we lost her a year later. So it was neat bridging back to the past. Speaking of bridges, Sunday we made our way east on 2 towards Mackinaw City. 2 is one of my favorite 2-lanes to travel…even back west into Minnesota & Wisconsin. 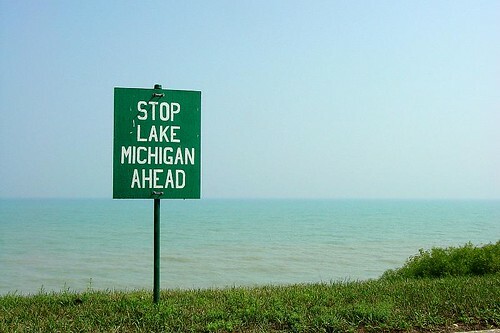 I’ve always had an affection for the Great Lakes, and 2 skirts it in several areas. We got to Mackinaw Citymid afternoon after crossing the Mackinac Bridge (Note: Traveling 300 feet above water on a 4 mile suspension bridge when there are wind warnings is a bad thing.). 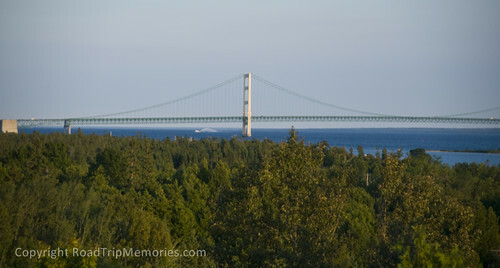 We had pasties for lunch and roamed the shops in Mackinaw City before getting a room at the Northwinds Motel on US 23, on the shores of Lake Huron with a great view of the bridge. We went out after playing cards and watching the Colts game on ESPN to take some night shots of the bridge. MI that had Cherry cider, but it wasn’t anything close to that at the Jack Rabbit in Arizona. We found a fudge place and then said aloha to Lake Michigan in southern Michigan and crossed back into Indiana in South Bend and took 31 back home to Indy.